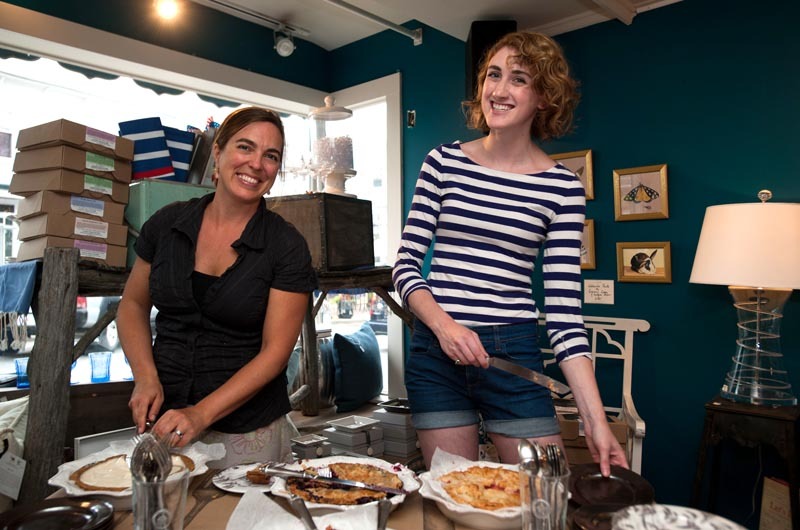 Chrissy Kinsman and Emily Diamond serve pie at Juliska — and everywhere else. On an unseasonably chilly Friday evening in Vineyard Haven, Juliska on Main street is packed, though oddly quiet save for the occasional “yum . . . this is good” and a persistent scrape of silverware on plates. Odd sounds for a store devoted to tablewear. Behind a table Chrissy Kinsman stands beaming. In front of her are the reasons for the night’s reverie. Pies, lots of them. Ms. Kinsman, aka head Pie Chick, cuts and delivers the four slices of pie to the grateful man. Ms. Kinsman is a subscriber to the notion that if you do what you love, you never work a day in your life. She came to the Vineyard 13 years ago to practice massage therapy, and has since found that the Island has always allowed her to follow what she enjoys. “There’s a magic to the Island, a lot of synchronicity,” she says. Case in point, this winter, less than 24 hours after she fantasized aloud about her dream of creating a pie making business, an industrial kitchen miraculously presented itself for lease. “[My husband] came home the next day having talked to Bob Skydell, who owns Fiddlehead Farm, and the kitchen was available . . . so I followed that,” she said. And with that Pie Chicks, a hand-crafted artisanal pie making venture, was born. It helps that Ms. Kinsman is no stranger to baking or business. She has a degree in finance from Ohio State University, and was for seven years the business manager and marketing director at the Farm Institute. But what matters now are pies, something she’s been focused on for most of her life. A self-described “science goober,” Ms. Kinsman took to pie making because it was unlike any other form of cooking. “It was just fascinating, the chemistry of it,” she says. She describes helping her mother make pie for the holidays and being drawn in by the specificity of it, the special techniques that yielded these classic baked goods. “I sold my first pie . . . on May 10. I know. It’s like six weeks.” And yet, just six weeks into the business and she is selling to Cronig's, Fiddlehead Farm and Edgartown Meat and Fish Market, and will soon be at the West Tisbury Farmers’ Market. Ms. Kinsman has already hired a full-time Guy Chick, fellow baker Samuel Nathans, a Delivery Chick, sister-in-law Kristi Kinsman, and a benevolent part-time pie assistant, Emily Diamond. Together the team churns out upwards of 60 pies a day. The demand is high but so is the exertion. Ms. Kinsman believes that pie has an innate goodness. And we’re not just talking flavor. It’s filling, traditional, straightforward and wholesome. 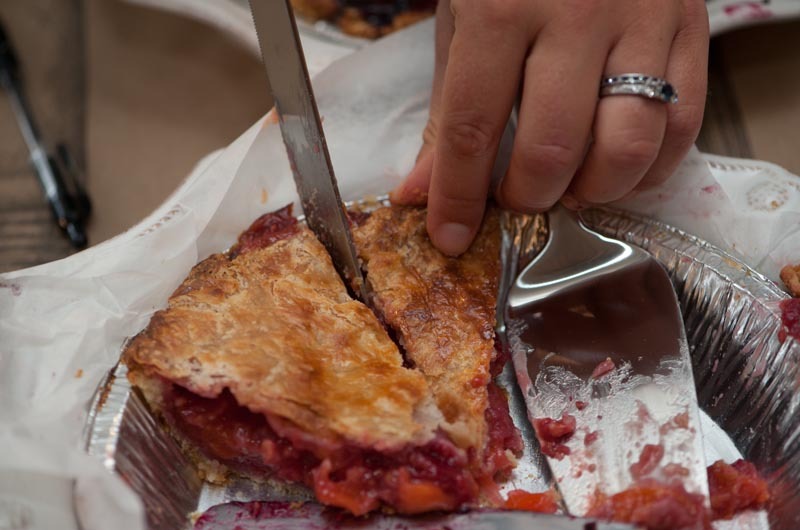 “The succinct sentence of it ­— people are better behaved after they’ve eaten pie,” she says. And it is true, folks at the pie eating event at Juliska seem to walk a bit dreamier after sampling her pies. They smile and nod to Ms. Kinsman on their way out. “Good pie,” they all say. Ms. Kinsman is raising money for her business through an internet indiegogo campaign. The campaign expires at midnight on July 5. Visit www.indiegogo.com/projects/pie-chicks. I loved the Pie Chicks story and I can taste the flavor as I read it. Thank you to Hannah McCarthy for an inspiring story of great taste and great pursuits! I want to go to the Vineyard and have some pie. What a great story, Very inspiring. I wish I could do what the Pie chicks do! Thank you Hannah McCarthy for bringing the tsates, sounds and inspiration to my home.